Equifax, Experian, and TransUnion are the “big three” among the many credit reporting agencies in the United States. Most banks and other lenders use these agencies for information when a borrower applies for a loan or credit card. Some employers use credit information to evaluate a potential new employee. Virtually everyone who has borrowed money to purchase a home or car, or has applied for a credit card, is in the databases maintained by credit agencies. Unless you have lived “off the grid,” the major credit reporting agencies have your full name, present and former addresses, date of birth, Social Security number, and probably your driver’s license number. Earlier this year, starting in mid-May, hackers gained access to Equifax’s database, which contained sensitive personal information on 143 million American consumers. There is a good chance that your personal information was stolen and may be exploited. Unfortunately, and regrettably, Equifax did not disclose this massive theft of consumers’ information until September 7th, giving hackers more than three months to use the stolen information. In the past few days, several Equifax executives have resigned, and it is likely that Equifax will be sued by many consumers whose sensitive information was, or is, used by hackers to open credit card accounts or borrow money fraudulently. What can you do to protect yourself? Equifax has a website (www.equifaxsecurity2017.com), where you can supposedly find out if your information was exposed. However, the website is not totally accurate, and you must enter the last six digits of your Social Security number to participate. Entering the last six digits of your SSN increases the odds that a hacker will figure out the remaining three digits, so we do not recommend using Equifax’s web site. Equifax also offers free credit monitoring for one year, but you must enroll by November 21, 2017. Given the circumstances that allowed criminals to steal Equifax’s data and the delay in announcing the theft, you should seriously consider if you want to trust Equifax to accurately monitor and report your credit activity. You have alternatives. First, we recommend that you check your credit reports from Equifax, Experian, and TransUnion for free by visiting the website www.annualcreditreport.com, and look for accounts or activity that you do not recognize. If you find accounts or activity that you did not open or authorize, your identity may have been stolen. If that is the case, visit www.identytheft.gov for advice. Second, consider placing a credit freeze on your files. To do so you must call every credit reporting company and request that your file be “frozen” to prevent new credit inquiries. Since most credit card companies and lenders always check the credit history and score with the agencies, putting a freeze on your account will likely prevent a criminal from getting a credit card or borrowing money in your name. Your existing creditors will still be able to access your account. The telephone numbers are: Equifax 800-349-9960; Experian 888-397-3742; TransUnion 888-909-8872. The cost of placing a credit freeze on your account will be $5 to $10 per agency. Third, you can contact the credit reporting agencies and request that a fraud alert be entered on your account. Doing so will not prevent a criminal from using your existing account(s) but will probably prevent the criminal from opening a new credit account in your name. There is no cost for having a fraud alert posted on your account. Finally, consider enrolling in an identity theft service such as LifeLock or Identity Guard. The cost is between $100 and $200 per year, which includes credit monitoring and vigorous response if a criminal uses stolen data to open credit cards or borrow money using your identity. The biggest data breach in history was when hackers targeted Yahoo and obtained information on more than one billion of its users’ accounts. However, that breach did not include Social Security numbers or driver’s license numbers. For its failure to secure consumer accounts in its database, Equifax has the dubious honor of allowing criminals to steal Social Security numbers and other sensitive information from more consumers than any other company in history. Attorney Robert L. Fisher, Jr.
Attorney Fisher may be reached in the firm’s Washington Depot office at (860) 868-0527, and by email at rfisher@cramer-anderson.com. 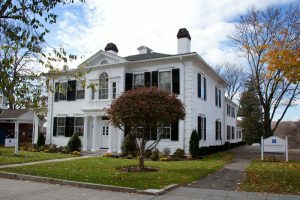 Cramer & Anderson also has offices in New Milford, Litchfield, Kent and Danbury. For more information, see the Cramer & Anderson website or call the New Milford office at 860-355-2631.